Sophie is an innovative Home Automation Solution that combines all the technology in your home into one easy to use interface. Built on an industry standard platform, Sophie works with Windows, Mac, iOS and Android devices. Sophie gives you control of all the systems in your home, including lights, blinds, home theatre, audio/video, security and climate locally or from anywhere in the world. 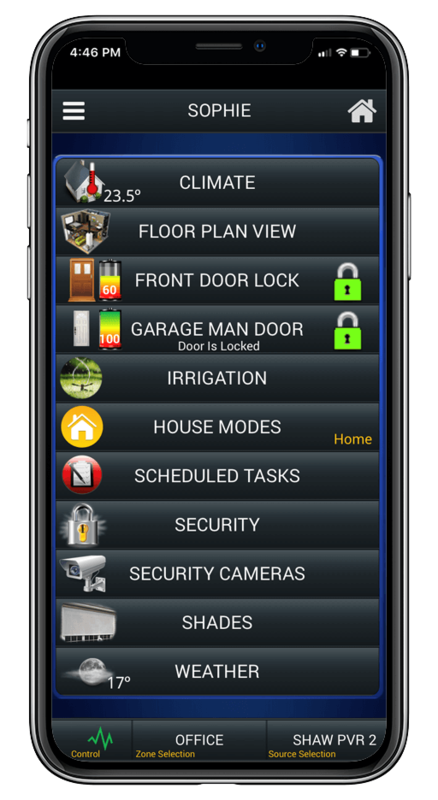 WHOLE HOUSE CONTROL AT YOUR FINGERTIPS! Enjoy your favourite movies and television shows throughout your home. Sit back and listen to your favourite music at the touch of a button. Plan your day around the current weather conditions. Adjust your home’s temperature from anywhere. Keep an eye on your home day or night. Arm / Disarm your Alarm System. Control your lights using our custom floor plan view. Never come home to a dark house again! Lock / Unlock your front door with the press of a button. Schedule events to occur whether you are home, away or on vacation. 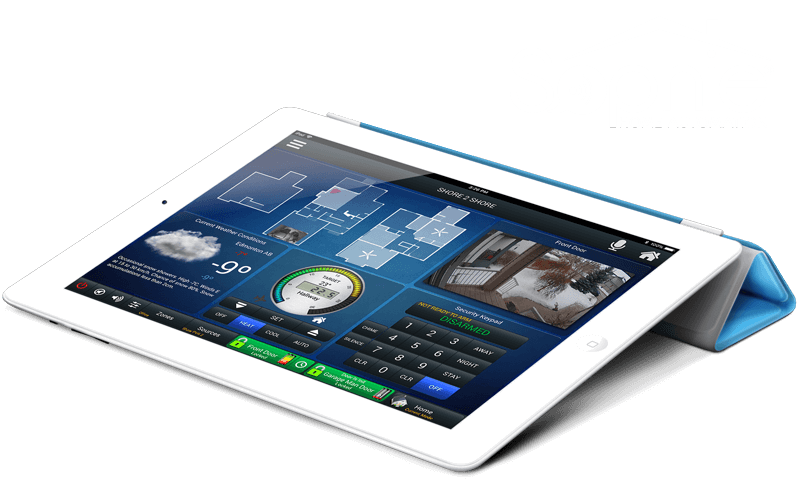 Sophie is like no other Home Automation System on the market. Designed with our client's needs in mind, Sophie is easy to use, responsive and reliable. With our unique floor plan navigation, it's never been easier to control your home. Sophie enhances your lifestyle by combining all the technology in your home into one easy to use interface. The task scheduler makes everyday events automatic. Have lights come on at sunset. Open and close your shades at a specific time or set the temperature of your home to a certain level. Sophie is backed by a level of after sales customer service that is unmatched in our industry. Simplicity. Sophie is intuitive and easy to use. Compatibility. Integrates with most major technologies. Affordability. Sophie delivers more value per dollar than other automation systems. Fully Customized. Sophie is designed with your specific needs in mind. Task Scheduler. We empower our clients with the ability to program and change their own schedules. Other automation companies bill for this service! Service. Our after sales support is second to none. The Canadian Western Bank has upgraded their camera system, including cameras, storage system and our software over the past two years. Shore 2 Shore was selected as the service provider for the entire system upgrade. They have done an excellent job in not only the upgrade, including installation of hardware throughout our facilities, but also assistance with the software selected and our service requirements. Their response to our services requests has been outstanding. They are an excellent company to work with, with proven, trained and professional staff. Shore 2 Shore Automation has been our official Camera System, Access Control and Audio/Video provider and has been able to meet all our requests, many of them on short notice. They are professional, knowledgeable and always looking at ways to help us solve our security and/or audio visual concerns. Without hesitation, I am confident in recommending Shore 2 Shore Automation Ltd to provide excellent service. Raptor Mining recently updated it’s camera system in an effort to both better improve security at our buildings and to improve the communication between our facilities and our customers. The high definition cameras that Shore 2 Shore installed do both of that and have been a great asset to the organization. Excellent work and service, thank-you to the team at Shore 2 Shore. Michael Homes Inc recently completed a new home construction working with Jay and Darryl Shore for the project. The undertaking was large scale and involved a great deal of planning and execution. The client is very happy and extremely satisfied with the quality of work and after sales support displayed by Shore 2 Shore. We would strongly recommend Shore 2 Shore Automation for anyone looking for A/V, Automation, Home Cinema, Lighting and Security. We know you will be very happy with your decision. Aquarian Renovations has worked with Jay and Darryl Shore for 2 projects this year. Both of these projects were of a large scale that involved a great deal of planning and execution. Final installation of their customized “Sophie” Home Automation Solution is where the details really start to show themselves and the talents of Shore 2 Shore really begin to shine. This is completed prior to the homeowner moving back into their newly renovated home. The fit and finish is impeccable and no detail is too small. Their workmanship is flawless, and the project is never complete, until the customer is satisfied. Their team is extremely knowledgeable, professional friendly, approachable and they thoroughly love what they do. Aquarian Renovations will continue to use Shore 2 Shore Automation exclusively on all projects in the future. Titan Flooring has been using the expertise of Shore 2 Shore Automation since April of 2007 and has been extremely pleased with the service provided. The team at Shore 2 Shore has provided us with consistent customer service and technical support in a timely manner. I would recommend them for your unique technology needs and peace of mind. Having worked with Shore 2 Shore over the past year I would like to express my extreme satisfaction with the service we have received from Jay and his staff. Any issues that we have challenged Shore 2 Shore with have been handled very professionally, and quickly. All follow-up service is concise and complete. If you are considering using Shore 2 Shore automation for any of their services I can confidently recommend Jay and his staff. Please do not hesitate to call me if you require any further information. We are pleased to express a high level of satisfaction and appreciation with the service that we have experienced with dealing with Shore 2 Shore Automation. We have purchased a variety of workstations and associated equipment from them with the most current features and competitive pricing. Their knowledgeable staff and quick deliveries made our purchases effortless and enjoyable. We believe that they are the right choice for purchasing computer related equipment. We are pleased to express a high level of satisfaction and appreciation with the solution that Shore 2 Shore Automation recommended, installed and supported in June of 2013. Jay and the team of professionals at Shore 2 Shore had designed the following systems for our needs as we were opening a new optometry practice in Grand Prairie. Shore 2 Shore’s knowledgeable staff and quick deliveries made our purchases effortless and enjoyable. still amazes us every time we use it. questions we had after finishing the project. Thanks again for the great work you guys did and we would be quick to call you again for future projects! Recently we completed a full home renovation. For our new project we were interested in the latest in Home Automation, Home Theatre, Distributed Audio and Video, Security alarm and intercom systems. We met with the Shore 2 Shore team and they designed a solution that included everything on our wish list and all within an affordable budget. Now that we have moved back in and have had a chance to use the system, we are extremely happy. We can control any TV location from our iPad on the wall, our mobile iPads, hand-held remotes and even our iPhones. We can arm and disarm our security as well as set our thermostat from anywhere in the world, even when we are on vacation. We can enjoy music on our deck when entertaining guests to playing our favourite streaming music in the office or ensuite. Our new Home Cinema is fantastic. We are enjoying watching movies with complete 7.1 surround sound. We are very happy and extremely satisfied with the quality of work and after sales support displayed by Shore 2 Shore. Great service and easy to work with. Designed our home audio/visual, alarm system and lighting automation. If we ever have any issues, always there to fix the problem and we like the app for our phone/ipad as makes running the music, lighting etc... very simple. Darryl, Scott and Bill are great guys and keep things simple for us non-techies and that's a good thing! You won't be disappointed with Shore 2 Shore. Great installment and upgrade to our system. Always professional and expedient!! Shore 2 Shore have been great for us. They designed and installed a great, integrated electronics system for our whole house. The whole process was a pleasure from design through to operation. In the two years since the system was installed, we have had a couple upgrades and adjustments and Shore 2 Shore has been very accommodating and quick to respond to our every request. We would highly recommend their service to anyone looking for security and entertainment electronic systems for their own home. This company is friendly, and professional. Installation is clean and organized, and the System is user friendly. Attention to detail and superb support!! Shore 2 Shore Automation is very knowledgeable and gets work done in a timely manner. Their home automation system is user friendly which to me was very important. They were also great at tailoring the home automation system to some of our special requests. Any questions or concerns I had they were always quick to respond. I would highly recommend Shore 2 Shore Automation for home automation.